Are you a current Infiniti owner? Take one step closer to feeling the exhilaration of an all-new Infiniti vehicle – and be rewarded for it! 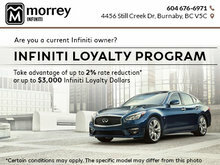 The INFINITI OWNER LOYALTY PROGRAM offers individuals who currently own an Infiniti vehicle, or are currently leasing or financing their Infiniti vehicle with Infiniti Financial Services to take advantage of a 2% Infiniti Loyalty Rate Reduction* or up to $3,000 Infiniti Loyalty Dollars* when they renew their lease or loan. 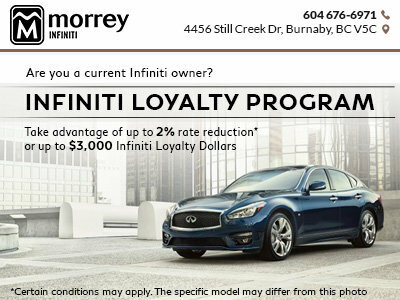 To learn more about the Infiniti Owner Loyalty Program, click the link below or contact Morrey Infiniti today!